B. m. un-named subsp., Chilean blue whale. 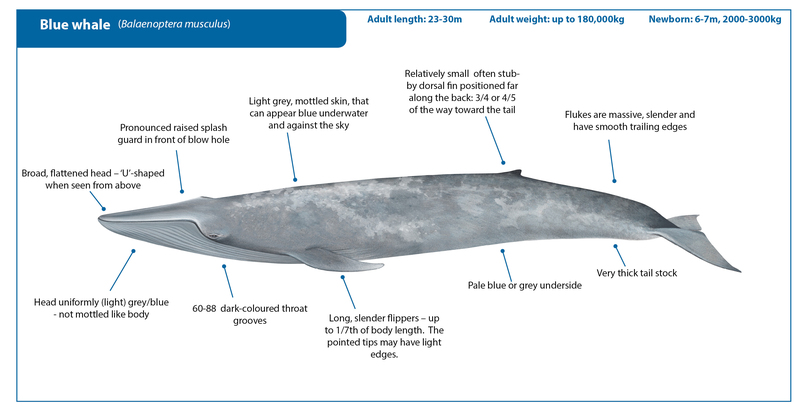 Pygmy blue whales are smaller and are generally restricted to the Southern Hemisphere including the Indian Ocean. 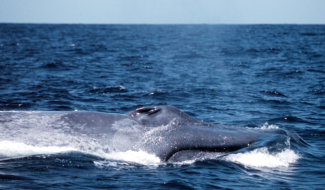 “True” blue whales refer to the larger musculus, intermedia, and indica subspecies. Antarctic blue whales (intermedia) are the largest of the species, but have been severely depleted after decades of whaling. Blue whales are usually found offshore, and their seasonal migrations and breeding and feeding grounds are generally poorly understood. However, there are a few places where they can be seen with some regularity during whale watching trips, such as the Gulf of California in Mexico, the Gulf of St. Lawrence in Canada, the California coast of the United States, and Sri Lanka. Blue whale lifting its tail flukes. Photo courtesy of Paula Olson. Blue whales have the sleek and slender body shape of other rorqual whales like Bryde’s, sei and fin whales. However, their great size and unique blue mottled colouration should make them easily distinguishable from any other species. Blue whales occur worldwide in all major oceans except the Arctic1,2. They are also absent from some regional seas such as the Mediterranean, Okhotsk and Bering seas. They are almost never seen off of eastern South America or eastern Australia. Despite their wide distribution the blue whales are not often encountered, partly due to their reduced numbers, and party because they generally occur in offshore waters, with only a few known coastal breeding and feeding areas. Blue whale global distribution. Adapted by Nina Lisowski from Jefferson, T.A., Webber, M.A. and Pitman, R.L. (2015). “Marine Mammals of the World: A Comprehensive Guide to Their Identification,” 2nd ed. Elsevier, San Diego, CA. Copyright Elsevier: http://www.elsevier.com. 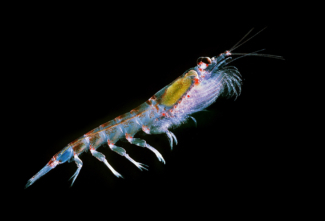 Throughout their range, blue whales feed predominantly on small shrimp-like crustaceans called krill. While the species of krill may differ from one ocean basin to another, the manner in which the whales feed is the same: usually lunge feeding through large swarms of prey, either by coming up directly underneath them with open mouths and throat pleats expanded, or by swimming on their sides with open mouths. While doing this, blue whales can engulf more than 100 tons of water and krill, then close their mouths and contract their throat pleats, thus forcing water out of their mouths and straining the krill through their baleen plates. 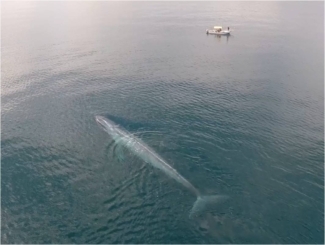 Blue Whale in Loreto Bay, Gulf of California, Mexico. Photo courtesy of Diane Gendron. 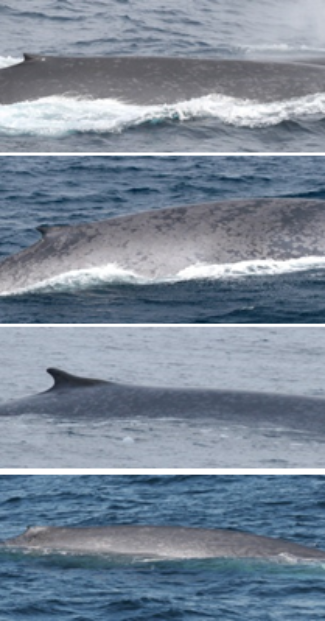 Individual blue whales can be recognized by the pattern of mottling on their flanks or sides. Researchers build up catalogues of individual whales, like those in Loreto Bay, Mexico, that have been monitored for over 25 years3, and to generate population estimates as has been done for blue whales off the coast of California4 and Chile. Blue whales are also studied through the attachment of satellite tags to track their movements over time and determine which areas are important for them. This approach helped to identify an overlap in blue whale habitat and shipping lanes off the coast of California5,6. The only known natural predator of blue whales is the killer whale7. A National Geographic documentary in 1978 showed the hunt and predation of a blue whale calf, but such events are rare: blue whales can usually outswim killer whales and escape any danger. While accidental entanglement in fishing gear poses the greatest threat to most other species of whale and dolphin, blue whales, with their great size and strength may be able to break free of gear more easily than other species. Reports of lethal entanglements for this species are rare, although 12% of blue whales found in eastern Canadian waters carry scarring consistent with fishing gear interaction1. 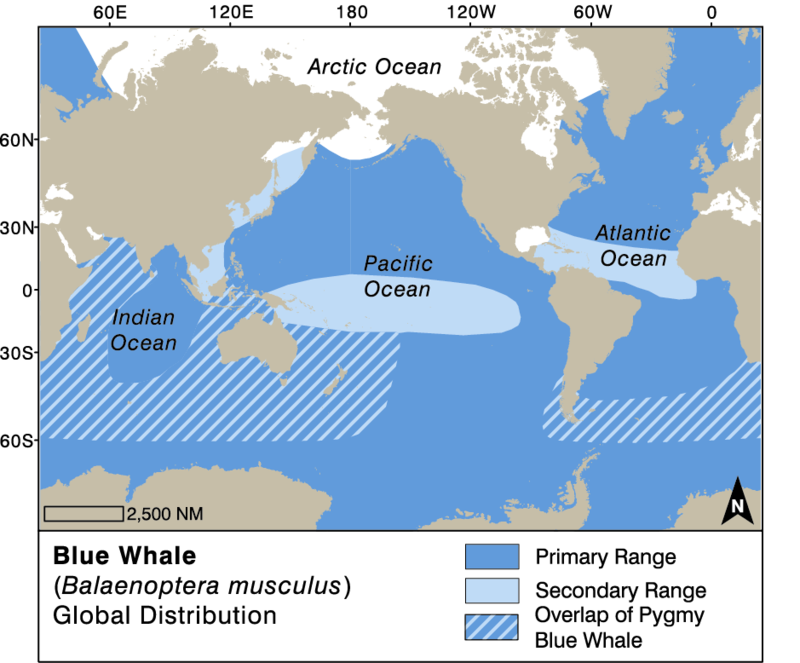 Ship strike is thought to present a greater risk to blue whales, especially in areas where their habitat overlaps with shipping lanes, as it does off the coast of California and Sri Lanka5,6,8,9. Commercial exploitation of krill and climate change affecting the distribution of krill in various ocean basins could also have a negative impact on blue whales10. Because a single blue whale yielded so much oil, it was highly prized by whalers, but until the advent of mechanized harpoons and factory ships that were fast enough and large enough to chase down and process blue whales, they had been relatively inaccessible. The greatest number of blue whales was taken in the first half of the 20th century, with nearly 30,000 whales killed in the 1930-31 season alone. Over 300,000 blue whales were killed in the Southern Hemisphere alone, and a further 20,000 in the North Atlantic and North Pacific combined. Blue whales have been protected from hunting by the IWC since 1966, and today some populations appear to be recovering at rates of up to 7% per year11. But many populations appear to still be small, and others are difficult to study due to their diffuse distribution in offshore waters. Globally, the species is listed as Endangered on the IUCN Red List, and under Appendix 1 on the Convention on Migratory Species CMS. The Antarctic subspecies is listed as Critically Endangered due to the fact that the current estimated population is still less than 1% of its original pre-whaling size12. Pygmy blue whales are considered data deficient on the IUCN Red List, and Northern Indian Ocean blue whales have not been separately assessed, but would most likely also be considered data deficient. 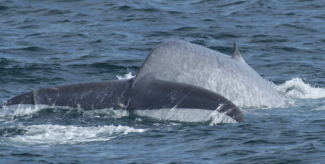 Individual blue whales can be recognised by the pattern of mottling on their flanks as well as their tail flukes, through a process called photo-identification. Photos courtesy of Paula Olson. When blue whales can be found, they offer a breath-taking spectacle. Even if they do not engage in the leaps and displays that are typical for humpback or right whales, their sheer size and grace will impress viewers. They are not often the main target of whale watching, and as such, few studies have focused on the potential impacts of whale watching on this species. However, researchers in Loreto Bay, Mexico have worked closely with national park authorities and whale watch tour operators to promote and implement ‘passive’ boat-based whale watching, a method where boats maintain a distance of at least 100m from whales and turn off their engines while watching them. This has been proven to have less impact on whales’ behaviour and can result in more prolonged and rewarding views of the whales. Read more about the Loreto Bay case study here. Blue whale and whale-watching vessel, Loreto Bay, Mexico. Photo courtesy of Diane Gendron. Sears, R. & Perrin, W. F. in Encyclopedia of Marine Mammals (eds W. Perrin, B. Wursig, & J.G.M. Thewissen) 121-124 (Elsevier, 2009). Branch, T. A. et al. Past and present distribution, densities and movements of blue whales Balaenoptera musculus in the Southern Hemisphere and northern Indian Ocean. Mammal Review 37, 116-175 (2007). Gendron, D. Population Ecology of the Blue Whales, Balaenoptera musculus, of the Baja California Peninsula PhD thesis, (2002). Calambokidis, J. & Barlow, J. Abundance of blue and humpback whales in the Eastern North Pacific estimated by capture-recpature and line-transect methods. Marine Mammal Science 20, 63-85, doi:10.1111/j.1748-7692.2004.tb01141.x (2004). Redfern, J. et al. Assessing the Risk of Ships Striking Large Whales in Marine Spatial Planning. Conservation Biology 27, 292-302 (2013). Redfern, J. V. et al. Predicting cetacean distributions in data-poor marine ecosystems. Diversity and Distributions, n/a-n/a, doi:10.1111/ddi.12537 (2017). de Vos, A., Brownell, R., Tershy, B. & Croll, D. Anthropogenic Threats and Conservation Needs of Blue Whales, Balaenoptera musculus indica, around Sri Lanka. Journal of Marine Biology 2016 (2016). McKenna, M. F., Calambokidis, J., Oleson, E. M., Laist, D. W. & Goldbogen, J. A. Simultaneous tracking of blue whales and large ships demonstrates limited behavioral responses for avoiding collision. Endangered Species Research 27, 219-232 (2015). Branch, T. A., Matsuoka, K. & Miyashita, T. Evidence for increases in Antarctic blue whales based on Bayesian modelling Marine Mammal Science 20, 726-754, doi:10.1111/j.1748-7692.2004.tb01190.x (2004). Branch, T. A., Matsuoka, K. & Miyashita, T. Evidence for increases in Antarctic blue whales based on Bayesian modelling. Marine Mammal Science 20, 726-754 (2004).